Aloha! 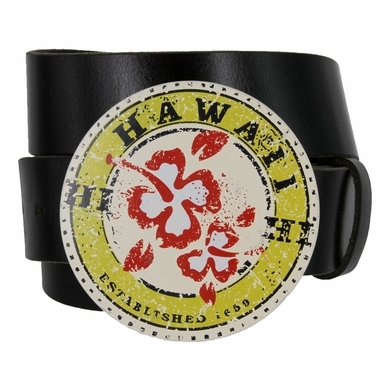 Show off your love for Hawaii with this sleek graphic print metal buckle. It has the established 1659 on bottom with Hawaii's initial and state flower Hibiscus art on front. Genuine 100% leather belt will show off this masterpiece for years to come. Buckle has 3.5" Diameter(approximately) and is interchangeable with any that accepts 1.5"(38mm) belt. Measure around where you wear the belt and order that size.